For just over a year now, I have been working on my first illuminated hilye. 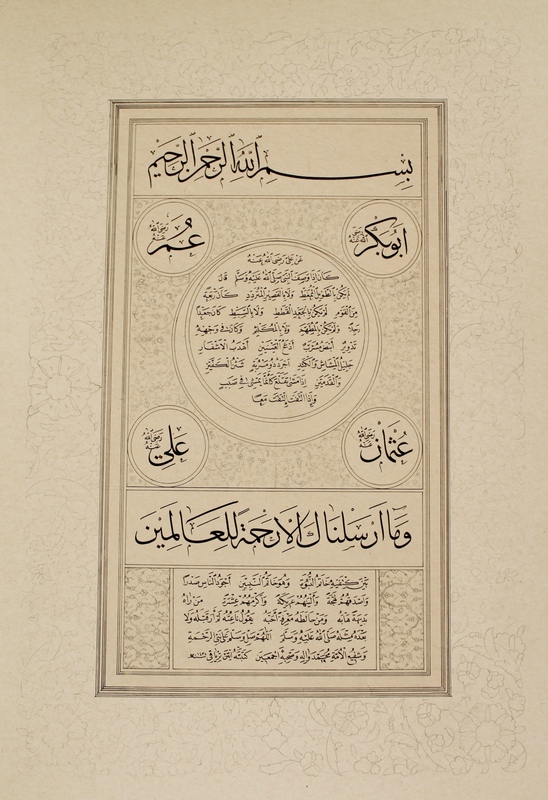 A hilye is a traditional Ottoman calligraphic composition that includes Qur’anic verses and a description of the physical and moral characteristics of Prophet Muhammad (peace be upon him). 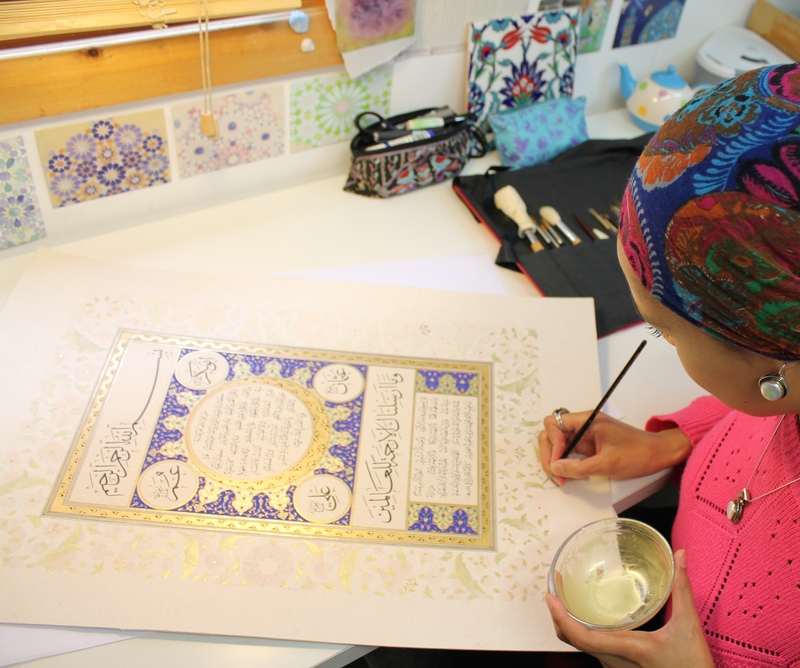 After a month of designing, correcting, redesigning and finalising sketches for the illuminated borders, I began illuminating my hilye last February. I always try to keep a record of my artworks in progress. Usually, my progress shots sit in the hard drive of my laptop, purely for my reference purposes. However, and since beginning this project, it struck me that very few people have the opportunity to witness the practice of a living traditional art. Unless we’re artists, craftspeople, art educators, or directly involved in some regular creative practice, we don’t often encounter traditional arts and crafts in our everyday lives. A few years ago, I delivered a workshop at a local primary school, where a teacher remarked that “a generation or two ago, children might have had hand painted china at home”, but now our encounter with hand-crafted everyday objects is becoming increasingly rare. I have thought about this in the intervening years, and was reminded when I came to paint my hilye. 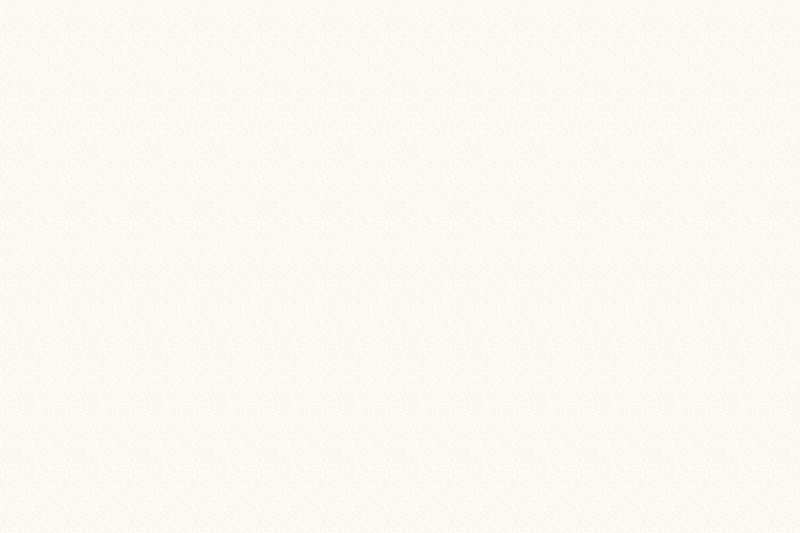 For that reason, I decided to keep an online visual diary of my hilye progress in a Facebook album. Now that the painting of my first hilye is slowly drawing to a close, I decided to share my thoughts, as well as images of the process here too. 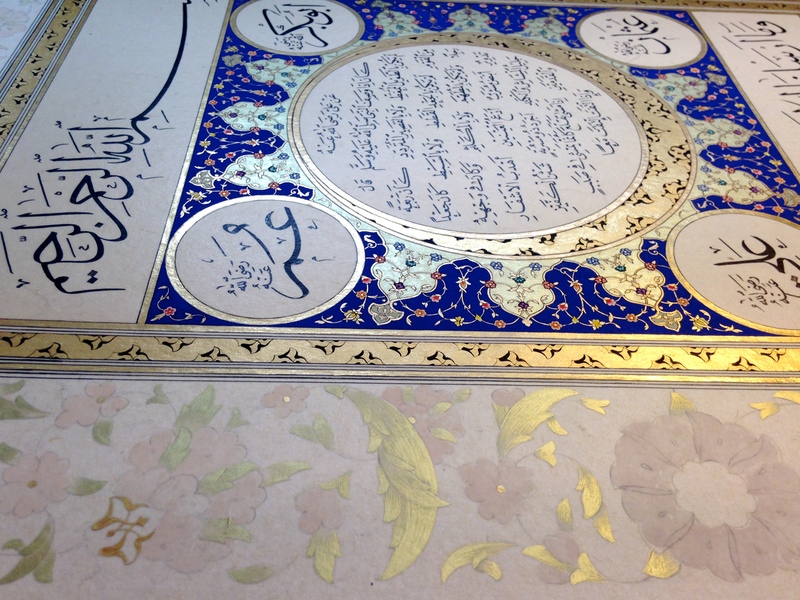 A hilye is the most challenging piece of work for any calligrapher or illuminator to make, and it is an honour to be deemed ready to make one. 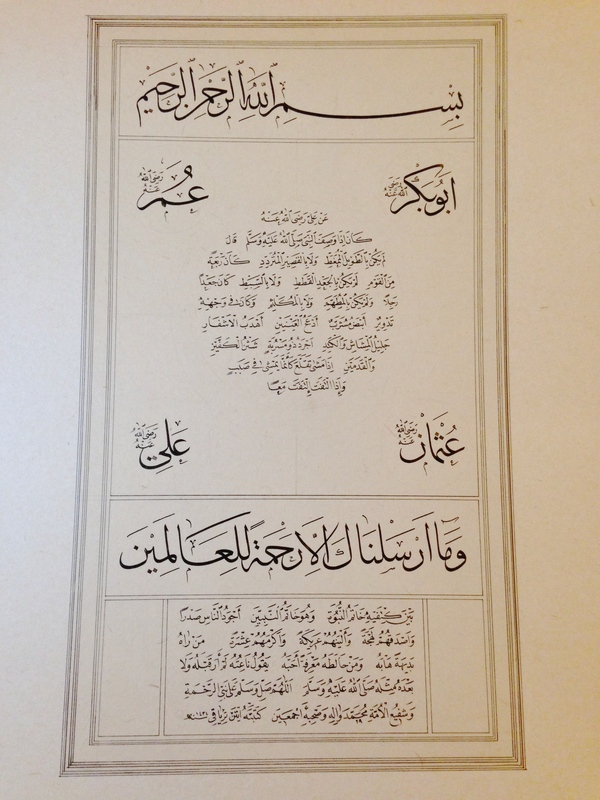 In the practice of Turkish illumination, students are often asked to make a hilye at the completion of their apprenticeship. 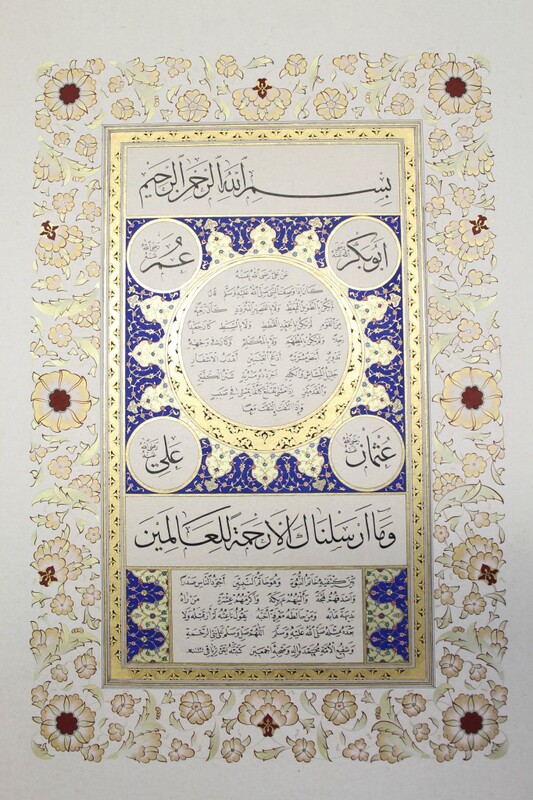 The complexity of the design, with its roundels, and rectangular calligraphic panels gives plenty of opportunity to showcase an illuminator’s skills. Several different styles of illumination are used on one piece. The key is to execute each style proficiently, and ensure that each section harmonises with the other parts. 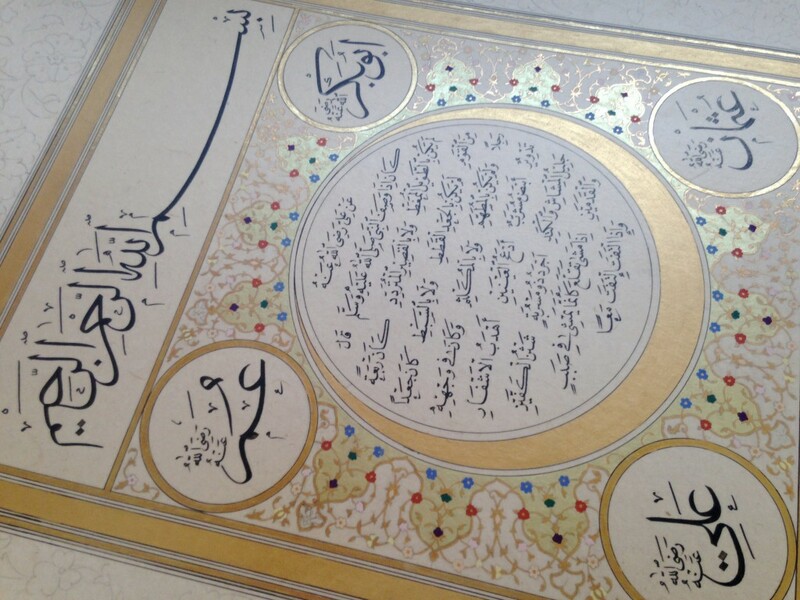 For a detailed and insightful article on the significance of the hilye, I recommend the following read by acclaimed American calligrapher, Mohamed Zakariya. Many people do not realise that the calligrapher and the illuminator are usually two different people. It is rare for one artist to be skilled in both crafts, but not impossible. An exception is my teacher, Ayten Tiryaki, a masterful calligrapher and illuminator, who wrote my hilye. 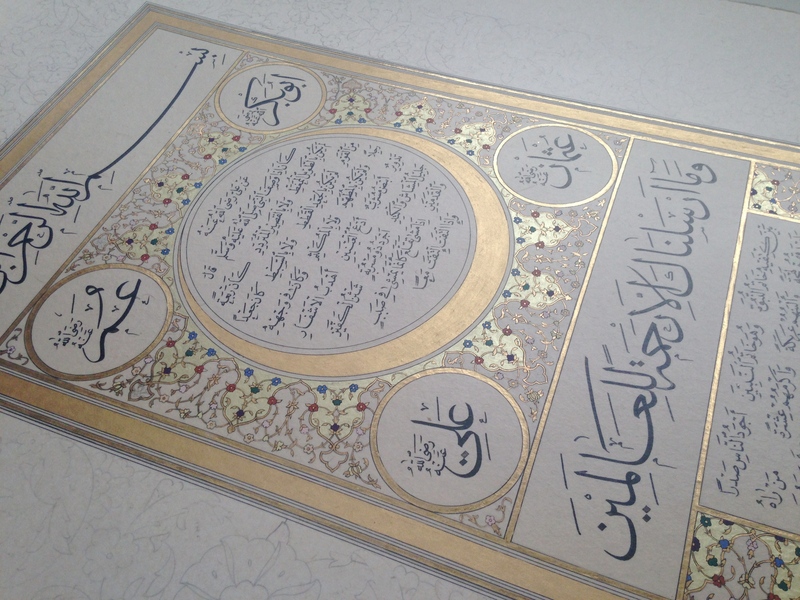 Once the calligraphy is written, it may be pasted onto a board, or handmade paper, then given to the illuminator, who will create a bespoke design according to the style, meaning, size, and character of the calligraphy. 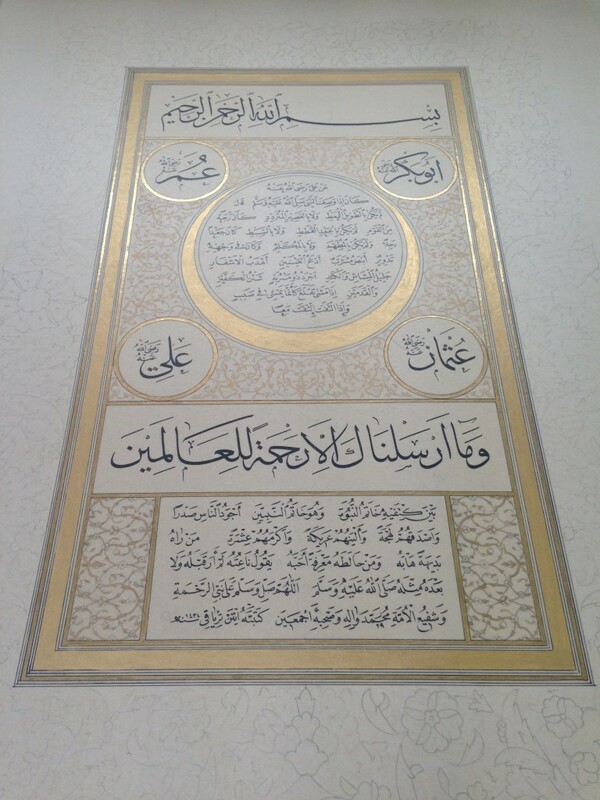 The four circular panels contain the names of Prophet Muhammad’s (peace be upon him) four closest companions: Abu Bakr, Omar, Ali and Uthman (may God be pleased with them all). 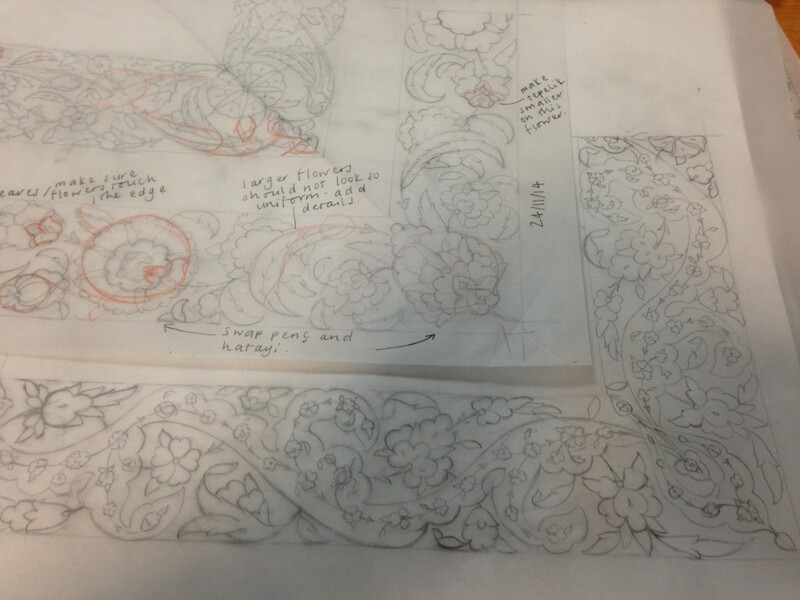 The illuminator’s sketches are made on tracing paper, where they are drafted and re-drafted until the design is coherent and harmonious. 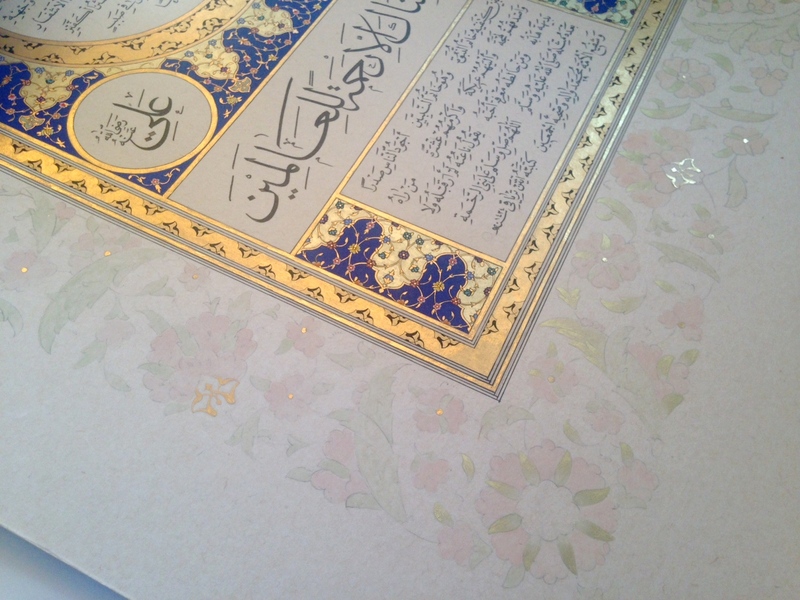 Once finalised, the first stage involves transferring the tracing onto the calligraphic piece. I tend to use a very fine 0.3 2H mechanical pencil for this job, but I do know of illuminators who burnish the back of the tracing paper with a smooth stone or shell. The pressure created by burnishing causes graphite from the pencil to transfer the design on to the piece. 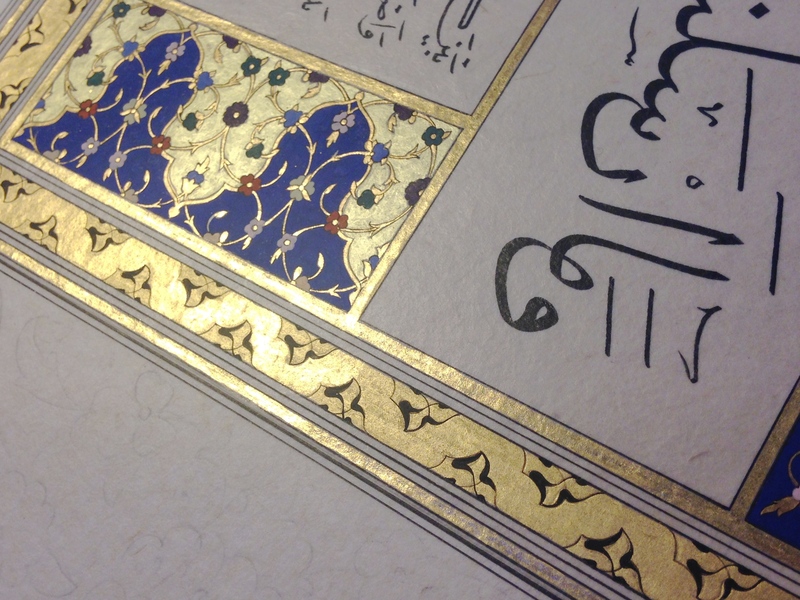 With the design traced onto the calligraphic piece, the next stage is to apply gold. The art of illumination is called tezhip in Turkish, and tezhib in Arabic, literally meaning “to gild”, or “to apply gold”. 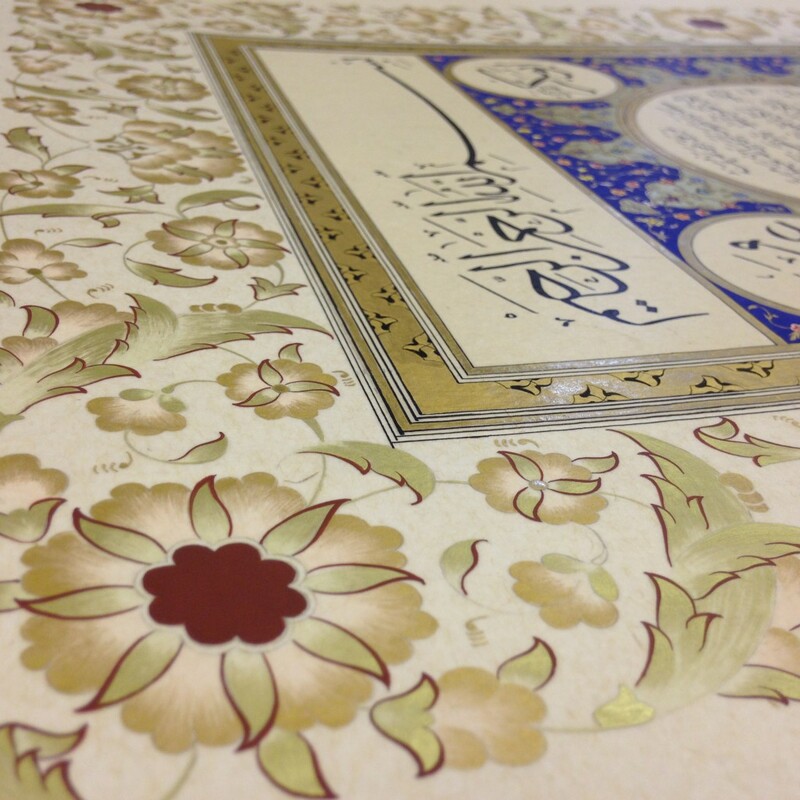 This signifies the importance of gilding, which is at the heart of illumination. Without gold, a painting is not an illumination. Furthermore, correct application of gold is key. Traditionally, illuminators work with a handmade paint called shell gold. Shell gold is hand ground gold leaf, mixed with a solution of water and gum Arabic, or water and gelatine, to create a paint. When made and applied correctly, the gold will shine brightly after burnishing. The crescent surrounding the main hilye text is called hilal in Arabic, which literally refers to the crescent moon. The circular illuminated space surrounding the main text is called shamsa, meaning “little sun”, indicating this area should appear as a stylised sun. The small illuminated rectangular panels at the bottom of the piece are called koltuk, and they are usually similar in style to the shamsa. This particular style employs tiny coloured flowers against a contrasting coloured background. Each flower has three shades of colour. The image below shows the first layer of colour applied to each flower. The next stage is one that beginners find the most difficult, and most daunting, though I admit I have come to love it: outlining. Yes, this is done with a paintbrush, not a pen or a pencil. Outlining sharpens and focuses each shape, adding clarity to the design. Once the outline has been added, it’s time to paint the blue background. 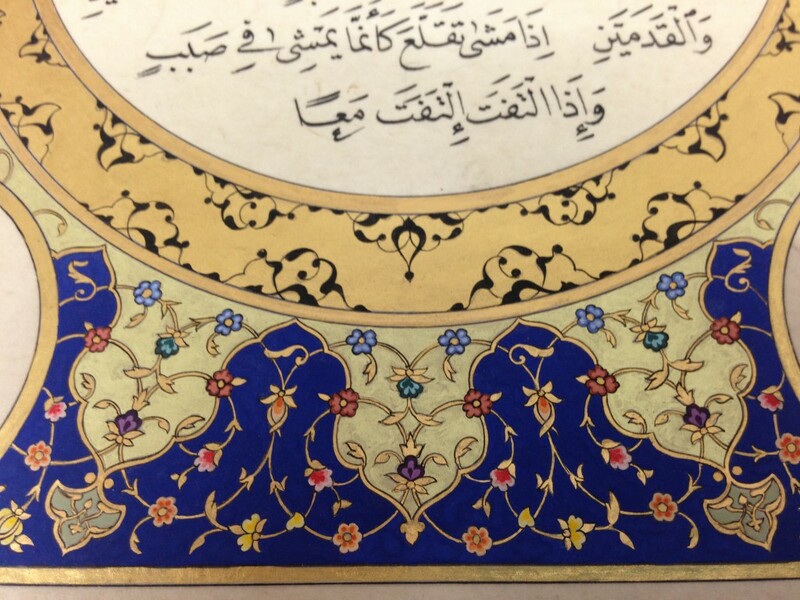 The illuminator carefully “floods” blue into the spaces between the gold and coloured flowers. This instantly offsets the gold, creating a striking contrast between the gilding and blue background. Illumination is a meditative art form, intended to invite the viewer and the practitioner into a contemplative state. I have always felt that the blue and gold floral patterns are reminiscent of Gardens of Paradise, as well as the starry Heavens. I love witnessing this part of the design take shape. Just as the shamsa (stylised sun) and koltuk are stylistically related, so too are the hilal (crescent) and the slim golden border. I chose to illuminate these sections with motifs known as rûmî. These were painted as delicate black silhouettes upon the gold. In the image below, you can see that some areas were burnished, giving a bright shine, while others were left matte. I love the contrast and depth this technique brings to the gold. The next stage was to add details to each of the coloured flowers. Shading gives each flower life and vibrancy. With the interior sections of the hilye more or less complete, it was time to move on to the large outer border, which would be painted in a completely different style. I applied more shell gold to the illuminated areas of the design, then washed pale pink and green watercolour over each leaf and flower. Using very fine brushstrokes, I carefully applied two shades of shell gold to illuminate each leaf and flower. I used handmade red ochre pigment paint to outline the large flowers on the outer border. I hope to add the final finishing touches over the coming months, insh’Allah, God willing. Wish me luck in completing this process! 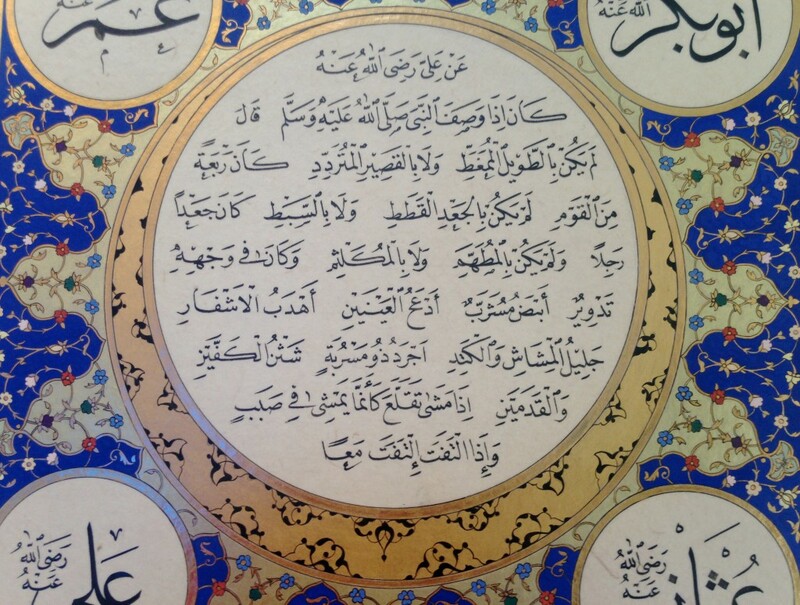 This entry was posted in Gilding, Islamic Manuscript Illumination. Bookmark the permalink.